The Tennessee Folklore Society's annual meeting was held at the Center for Popular Music On October 25, 1014. 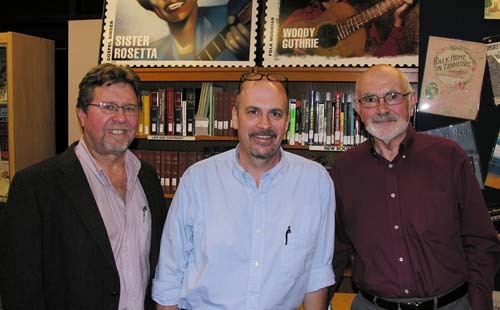 The photo below shows three of the busiest presenters: Roby Cogswell, soon-to-be-retiring Tennessee Folk Arts Coordinator; Shawn Pitts, current President of the Society; and Steve Davis, who managed the Davis Unlimited record label. 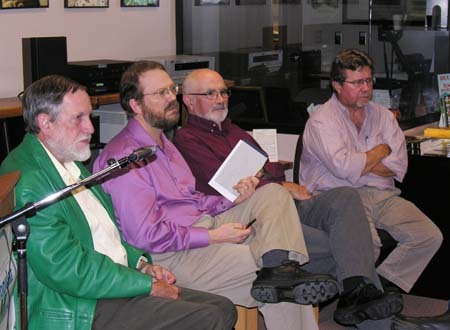 The next photo shows the panel of three people who have managed folk music recording labels: David Evans who managed High Water Recording Company, John Fabke who manages Spring Fed Records, and Steve Davis who managed Davis Unlimited Records; along with moderator Roby Cogswell. Among the presenters were two graduate students. 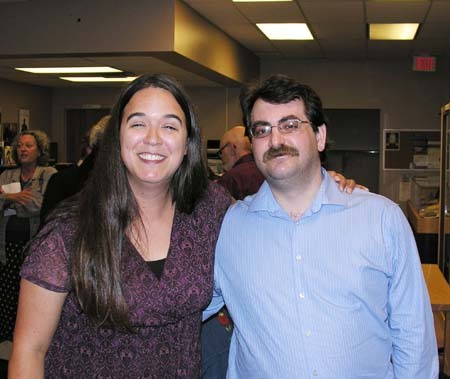 Karen Hogg of Western Kentucky University spoke about the Charles Wolfe Collection, and Daniel Fleck of the University of Memphis spoke about Norman Blake. 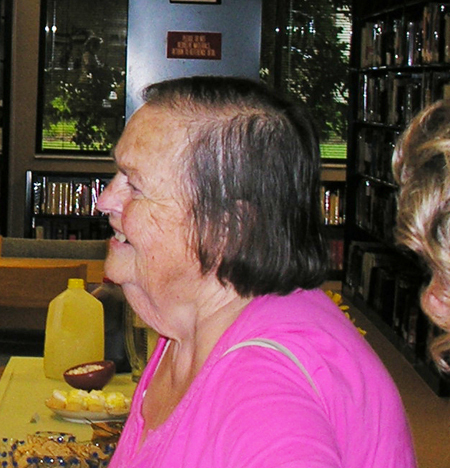 Attendees included longtime members of the Tennessee Folklore Society and Tennessee Tech professors Graham and Bettye Kash. 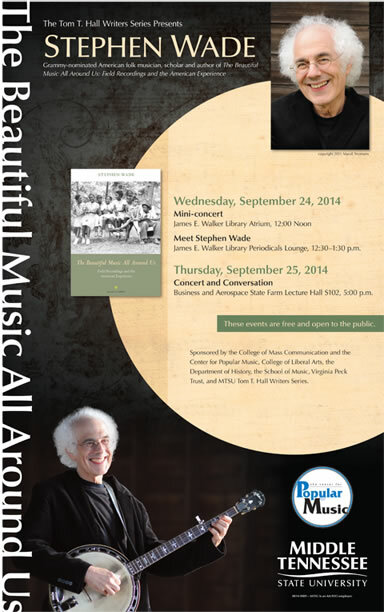 Renowned folk scholar and Grammy nominee Stephen Wade brought the music, stories and photos of the American South to MTSU in September 2014. The event featured free public concerts and chats. Wade’s visit was part of the university’s Tom T. Hall Writers Series and was co-sponsored by the College of Mass Communication’s Center for Popular Music. The largest event, “A Concert and Conversation with Stephen Wade,” was held Thursday, September 25, at 5 p.m. in Room S102 of MTSU’s Business and Aerospace Building. Wade also performed a mini-concert at noon Wednesday, September 24, in MTSU’s James Walker Library Atrium, followed by an informal meet-and-greet session in the library¹s Periodicals Lounge from 12:30 to 1:30 p.m. Additionally, he made an appearance on WMTS FM-88.3’s “Justin Reed Show before a live audience Thursday morning at 9:30 a.m. in the Center for Popular Music Reading Room, located inside the Bragg Mass Communication Building. Wade’s performances blended live music, projected imagery and spoken narrative to explore the stories in his award-winning 504-page book, The Beautiful Music All Around Us: Field Recordings and the American Experience (University of Illinois Press, 2012). The book tells the fascinating stories of iconic Library of Congress field recordings made between 1934 and 1942, from Southern Appalachia down to the Mississippi Delta. 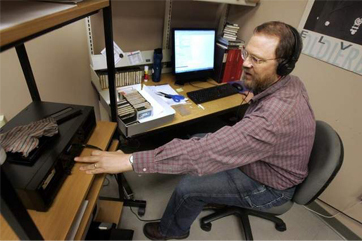 Wade spent years researching the people behind these recordings, and worked closely with their descendants. To learn more about the book and music, visit http://ow.ly/uBEEA. Wade developed acclaimed theater performances, including “Banjo Dancing” and “On The Way Home,” to share his love of folk music and history. Wade also was a part of the public television documentary “The Unquiet Library,” a study of the Library of Congress’s music division, and has authored essays, reviews and articles published around the country. He has recorded and/or produced more than a dozen albums, including his most recent, the Grammy-nominated “Banjo Diary: Lessons from Traditions” on the Smithsonian Folkways label. 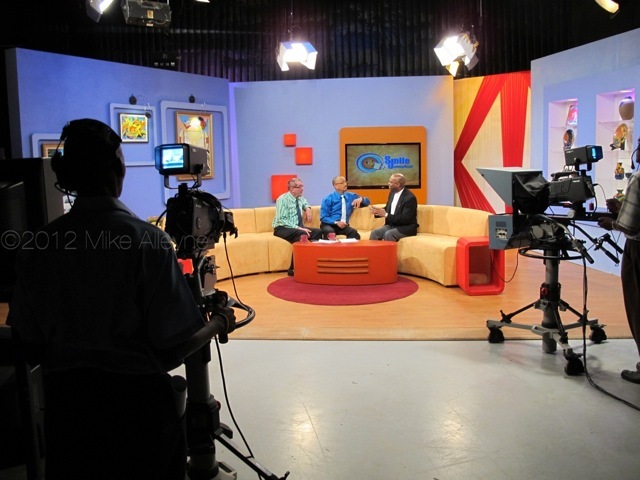 Wade’s appearances were co-sponsored by the MTSU’s College of Mass Communication, Center for Popular Music, College of Liberal Arts, Department of History, School of Music, and the Virginia Peck Trust. Dale Cockrell retired as Director of the Center for Popular Music on June 30, 2014. Here are some photos from his retirement party. New CPM Director, Dr. Greg Reish, is welcomed to his new role by Dale. Provost Brad Bartel shares stories about Dale, and emphasizes his own strong vision for the CPM. Lucinda Cockrell shares a poem that summarizes Dale's accomplishments. 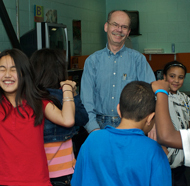 National scholars such as Doug Seroff stopped by. Special friends of the CPM such as Mary Dean Wolfe come to offer their best wishes. 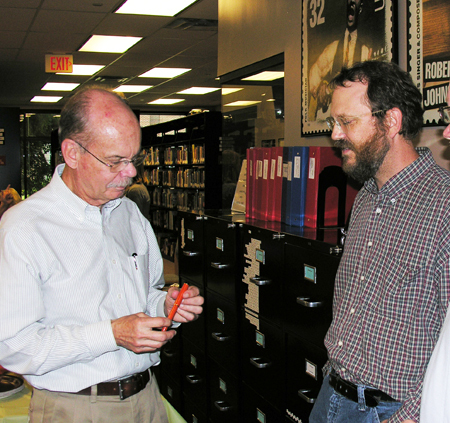 CPM staff member John Fabke gives Dale a special pen as a symbol of his appreciation. A GREAT TIME WAS HAD BY ALL! DALE'S LEADERSHIP WILL BE MISSED. 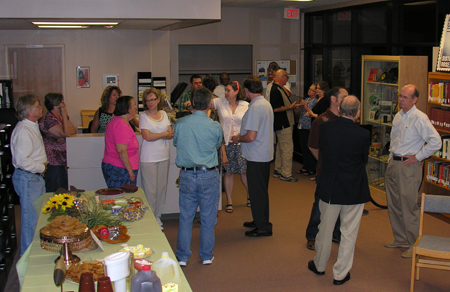 These photos are from the June 6 opening of the exhibit “Wicked Good Fiddling! 200 Years of Fiddling, Fiddlers, and Fiddle Making in Maine,” in the Lewis Gallery of the Portland Public Library, in Portland, Maine. 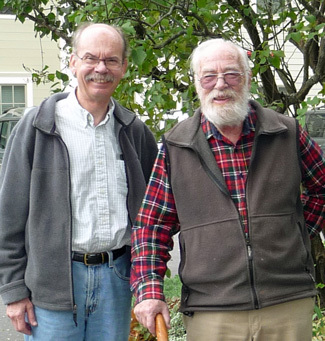 The exhibit was curated by Paul F. Wells, Director Emeritus of CPM (who now makes his home in Maine) and Thomas A. Wilsbach, Arts Librarian at the PPL. Maine has a rich heritage of fiddling that encompasses strains of Yankee, Franco-American, Maritimes, and, to a lesser extent, Irish-American cultures. The exhibit explores and celebrates this heritage by bringing together a wide range of materials—photographs, printed and manuscript tunebooks, sound recordings, concert flyers, and dance cards—that document the Pine Tree State’s vibrant fiddling traditions. Maine has also been home to a surprising number of fiddle makers; researchers have identified more than 200 professional and amateur craftspeople in Maine who have made violins. 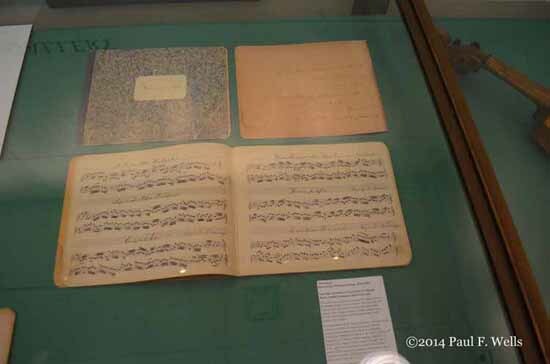 Two 19th century tune manuscripts with a Maine provenance from the CPM collections (seen in the display cases here) are key components of the exhibit. These two items, which Wells acquired for CPM during his tenure as Director, provide important documentation of the history of the New England fiddle tune repertoire. 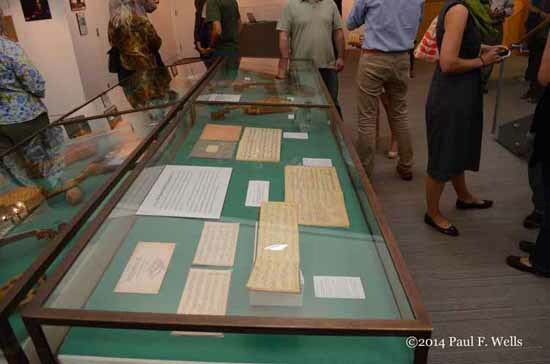 The exhibit also features materials from the Archive of Folk Culture at the Library of Congress, from the Maine Historical Society, from many individuals within the Maine fiddling community, and from Wells’ personal collection. The production of “Wicked Good Fiddling!” was supported by a grant from the Maine Humanities Council. It is open until August 15. 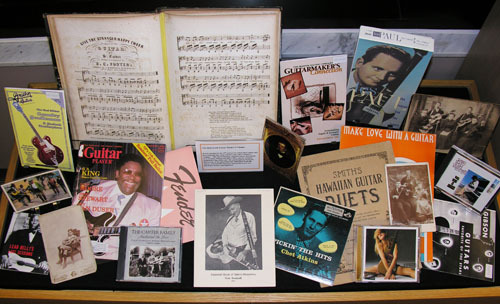 The Center for Popular Music is proud to present a selection of materials from our collection for the American Guitar exhibit! The Center for Popular Music is pleased to announce that Dr. Drew Beisswenger has joined the staff as the Head Librarian, with special duties in reference and information technologies. 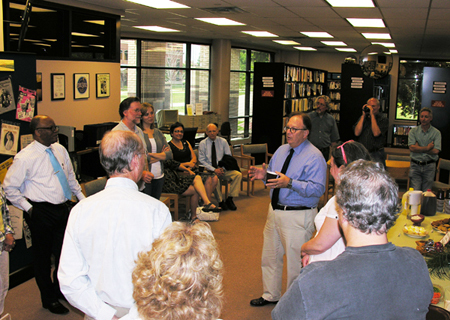 Drew comes to the Center from Missouri State University where he was the Head of Music and Media Collections. He is exceptionally well-degreed, with a Ph.D. in musicology from the University of Memphis, a Masters of Library Science from the University of Alabama, an M.A. in Folk Studies from Western Kentucky University, and a B.A. in Folklore from Indiana University. He is the author of seven books and editions on folk music and fiddling, along with many articles and presentation. Drew is also a musician: a keyboardist, double bassist, guitarist, fiddler, singer, and a songwriter. Welcome, Drew, to the College of Mass Communication and the Center for Popular Music. 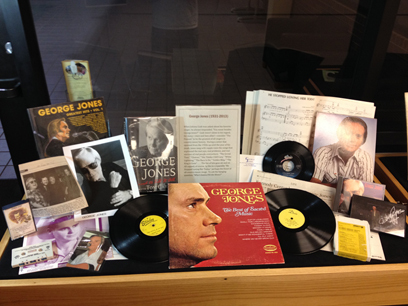 Our last exhibit in the Center for Popular Music's Reading Room cases was a tribute to George Jones. Elaura Highfield, a Graduate Assistant working toward a Masters degree in Public History pulled a sampling of materials from the CPM's collections to create the exhibit. 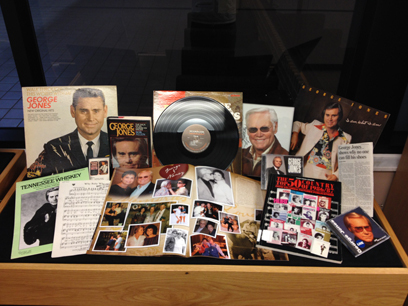 They included sound recordings of all formats (did you know that George Jones recorded 78 rpms on the Starday and Dixie labels? ), photographs, songbooks, newspaper clippings, autographs, posters, tickets, and other ephemera. Take 6 inducted into the Gospel Music Association Hall of Fame! 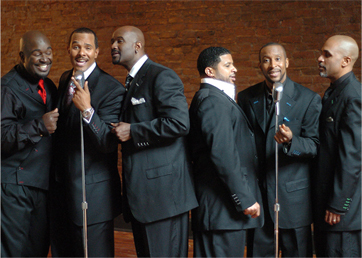 Take 6, renowed a cappella gospel music sextet, to be inducted into the Gospel Music Association Hall of Fame. The group, which includes CPM Advisory Council member Cedric Dent, integrates R&B and jazz influences into their devotional songs. They have garned ten Grammy wins, ten Dove Awards, one Soul Train Award and two NAACP Image Award nominations. Collaborations have included work with Stevie Wonder, Whitney Houston, Don Henley, Ray Charles, Queen Latifah, Joe Sample, Quincy Jones, Marcus Miller, Brian McKnight, Gordon Goodwin, k.d. lang, Luis Miguel, Ben Tankard, Al Jarreau, and CeCe Winans. We have a new server! If you are in the business of archiving music, this is cause for a celebration. In order to accommodate our ever-increasing archival storage needs, the CPM has invested in a new larger-capacity server. We use the best practices and standards for all of our archived digital audio and image files and they are large. We have other projects going on as well, and we have a back-up and migration process that insures the future longevity of all of our efforts. CPM featured in a Murfreesboro Post article about Barry Gibbs recent appearance. 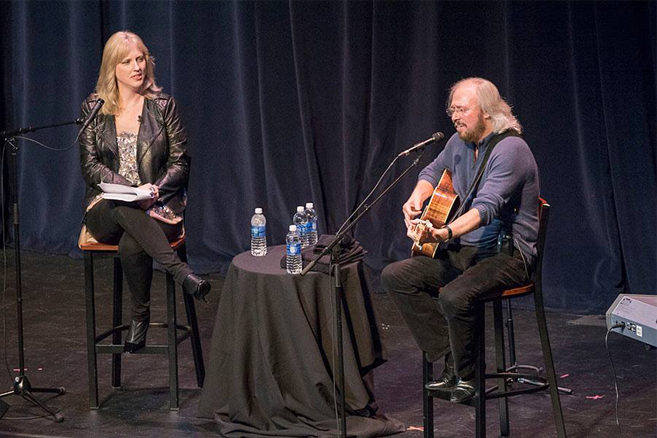 The Center for Popular Music has been featured in a recent Murfreesboro Post article delivering a personal take on Barry Gibb's appearance at MTSU. Written by Steve Morley, the article discusses the night in a macro fashion as well as from the perspective of the author. 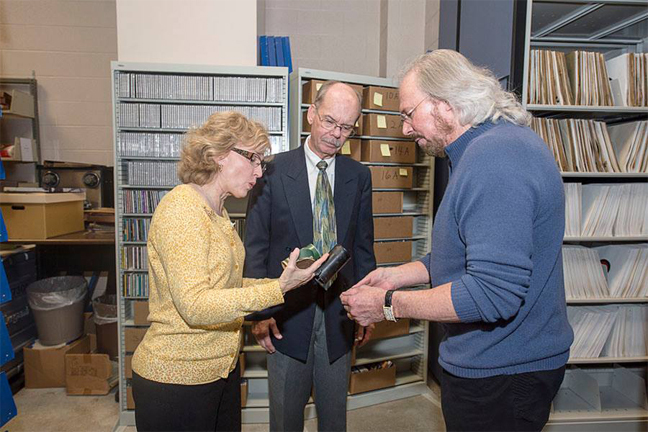 "All Gibb, No Glib: A Bee Gee Brings Glee to Middle Tennessee"
The Center for Popular Music has been featured in a recent NPR article about "why archives matter." Written by Ann Powers, the article explores the value of musical history and describres her experiences within the archives of the Nashville area. 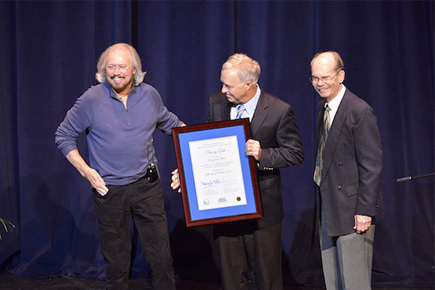 "Holding Music History In Your Hands: Why Archives Matter"
MURFREESBORO — Legendary singer and songwriter Barry Gibb was honored Monday night as the inaugural fellow of The Center for Popular Music at MTSU's College of Mass Communication. 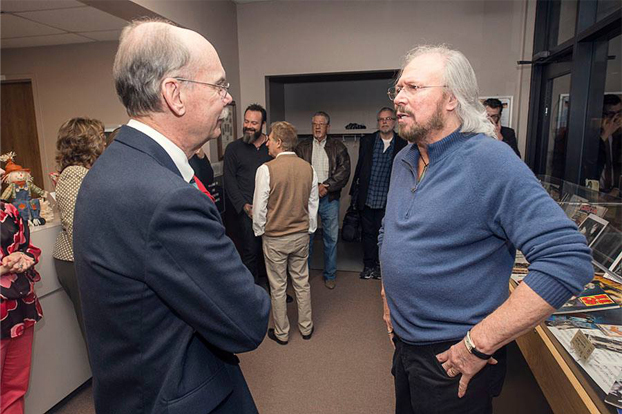 Gibb, a founding member of the pop-sensation Bee Gees, received the honor before speaking at MTSU's Tucker Theatre for an event billed as his first lecture and performance combination. The artist came to campus at the invitation of John Merchant, an assistant professor in MTSU's Department of Recording Industry who toured with Gibb for years as part of his sound production team. 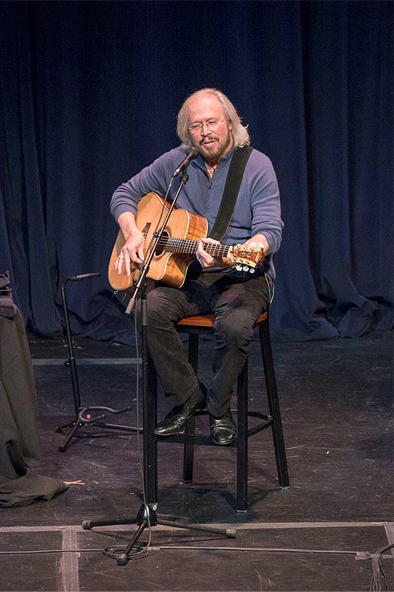 "Barry Gibb's career has been characterized by its breadth, depth and consistently high quality, embracing shifts in popular music with intuitive ease — and emerging at the top of the charts in five different decades," said Ken Paulson, dean of the college, who helped present the honor to Gibb. "We are pleased to honor his singular achievements in popular music." The fellowship recognizes Gibb's extraordinary accomplishments as a performer, songwriter and producer. He is cited in the Guinness Book of World Records as the world's most successful songwriter after Paul McCartney. Gibb and his brothers have been topping the charts since the 1960s, becoming the only group in pop history to write, produce and record six straight No. 1 hits. The Bee Gees had 16 Grammy nominations and nine Grammy wins. Gibb also has had No. 1 songs in the 1960s, 1970s, 1980s 1990s and 2000s and is the only songwriter in history to write four successive U.S. No. 1 hits: The Bee Gees' "Stayin' Alive" in 1978, replaced by youngest Gibb brother Andy's single, "Love Is Thicker Than Water," followed by the Bee Gees' seven-week run for "Night Fever" and Yvonne Elliman's "If I Can't Have You." The Bee Gees' and Elliman's singles all originated with one of the top-selling albums of all time, the film soundtrack from "Saturday Night Fever." Dr. Dale Cockrell, director of the Center for Popular Music, said Gibb's honor is the first of its kind conferred by his organization. 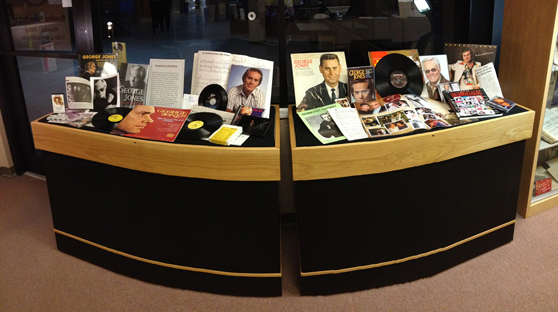 "The Center for Popular Music has long provided special opportunities for the study of popular music and encouraged his appreciation and enjoyment," Cockrell said. "With its Fellow program, it begins to recognize those who have made special contributions to its development. "No one deserves this inaugural honor more than Barry Gibb, who has for five decades provided the soundtrack to American lives." MTSU President Sidney A. McPhee said Gibb's honor also underscored the important work by the center, which was established in 1985 as a state-sponsored Center for Excellence with a mission to promote research in American vernacular music. 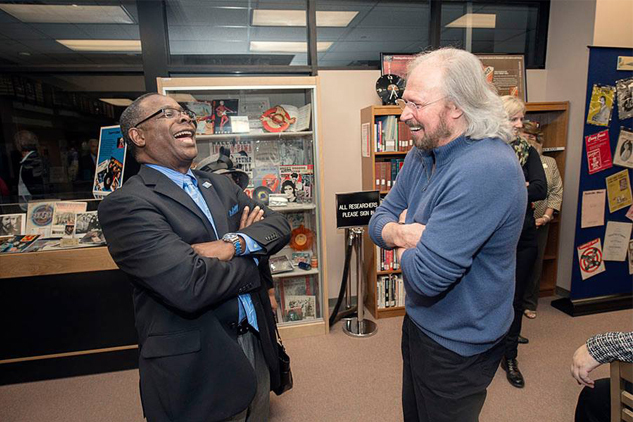 McPhee said the center works to "foster an understanding and appreciation of America's diverse musical culture." "The Center for Popular Music is a premier, singular element of our university," the president said. "Mr. Gibb's record of accomplishment and body of work reflects the very best of what our center was established to study and preserve." 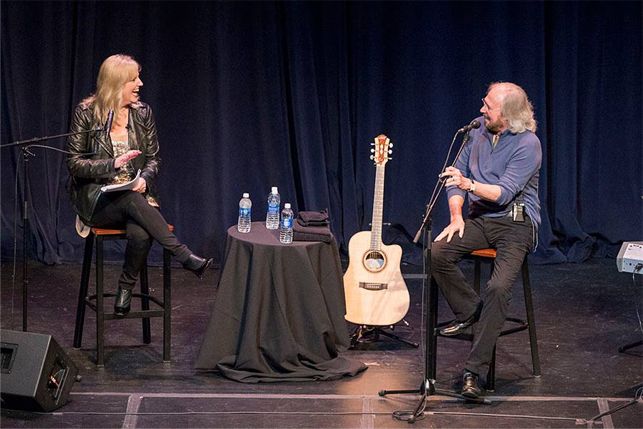 Recording Industry Chair Beverly Keel said she was pleased that Gibb's appearance at MTSU provided an opportunity for the center — and the entire university community — to connect with the legendary performer. "We take pride in providing top-notch opportunities for our students to learn from the best," Keel said. "Professor Merchant's ties to Mr. Gibb allowed the university to benefit from one of the greatest musical talents in popular music." 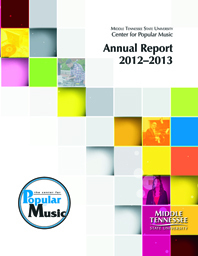 The Center for Popular Music has just releases its 2012-13 annual report! The report includes information about the center's collection, programs, exhibits, research, and more. CLICK HERE, to open the report in PDF format, or click the following link to be directed to the center's annual report page: "Annual Reports"
The Center for Popular Music has been featured in a recent dnj article for its important work. "MTSU's Center for Popular Music works to show past musical sensibilites"
Dr. Dale Cockrell, Director of the Center for Popular Music, has recently been elected to the Board of Trustees of the International Bluegrass Music Museum in Owensboro, Kentucky. Dr. Cockrell has had a long relationship with the Museum, for he (along with Assistant Director Lucinda Cockrell) was part of the design team that led the renovation of the Museum in 2001. 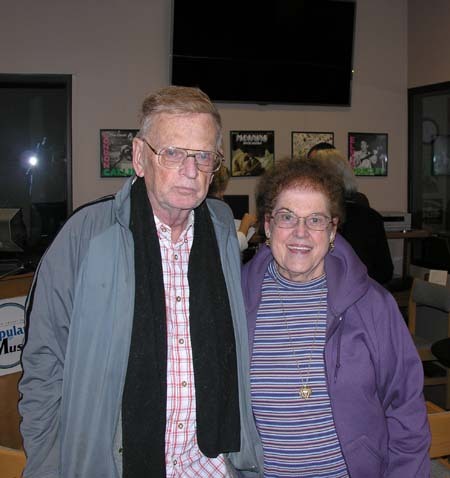 "The International Bluegrass Music Museum"
The Center for Popular Music at Middle Tennessee State University has recently aquired a collection of scores, photographs, and other historical materials belonging to the late songwriter and arranger, Joel S. Herron. The collection was generously donated by Herron's son, Roark Herron, adding to the center's prestigious collection of works. 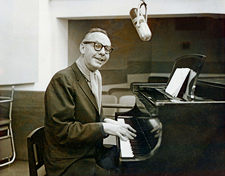 Herron is most known for writing the music to Frank Sinatra's hit, "I'm a Fool to Want You." He also wrote over 100 other copyrighted works and regulary led an orchestra in some of New York's biggest clubs. "MTSU Center for Popular Music welcomes songwriter's works"
The Center for Popular Music at Middle Tennessee State University in collaboration with the American Antiquarian Society in Worcester, Massachusetts, has received a grant of $127,956 from the National Endowment for the Humanities to digitize, catalog, and provide web-based public access to their American vernacular music manuscripts. 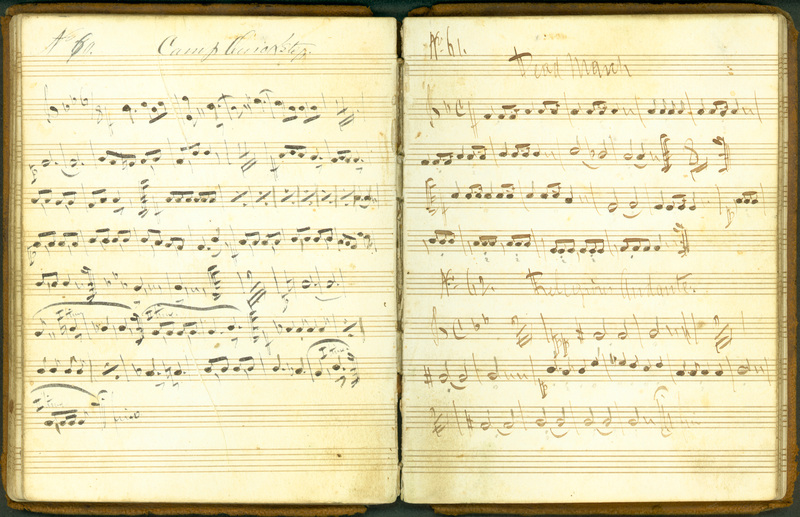 This award, made under provisions of the "Humanities Collections and Reference Resources" program, will enable the construction of an "American Vernacular Music Manuscripts" website featuring a searchable, multi-field database and hi-resolution images. A far-reaching aspect of the project is that it will establish vernacular music manuscript cataloging guidelines so that hundreds of other archives, libraries, and historical societies with similar manuscripts may catalog and make available their holdings. The hand-written manuscripts included in this project, which date from ca. 1730-1910, include commonplace books, copybooks, and single and double leaves. 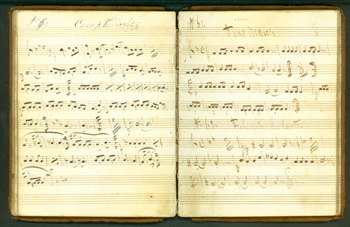 Each manuscript is unique and each typically documents music-making by a single person at a specific time and place and for a specific function. Since the manuscripts are primary evidence of musical taste or usage they serve a scholarly function distinct from printed music, which typically documents only accessibility. 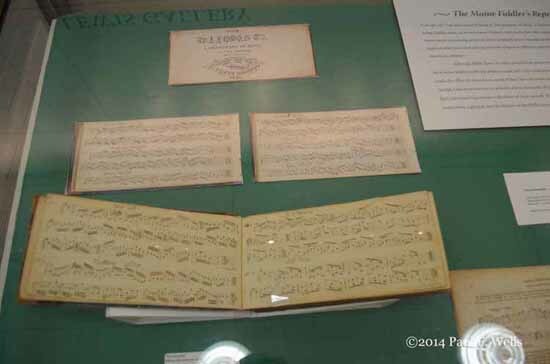 The two collections to be cataloged and digitized hold fiddle/fife/flute dance tunes, hymns, songs, ballads, and keyboard pieces, totaling about 9,000 pieces of music. Together there are more than 8,000 manuscript pages in approximately 250 manuscripts, most all of American provenance. "NEH announces $17.4 million in awards and offers for 205 humanities projects"
"National Endowment for the Humanities Grant Awards and Offers, April 2013"
The Center for Popular Music at Middle Tennessee State University has been awarded $19,993 by the GRAMMY Foundation to inventory, preserve, and provide access to the Charles K. Wolfe Audio Collection. There are nearly 4,000 tapes in the Wolfe Audio Collection, many of which are oral histories of musicians or field recordings. Dating from the 1930s–2000, this is likely the premier collection in the American Mid-South region. The Center will inventory the contents, conserve the recordings, transcribe to digital format when appropriate, and make the collection publicly accessible. 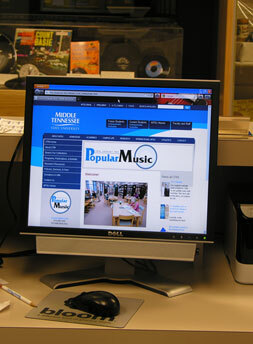 MusicSprings is a project of the Arts Center of Cannon County (Tennessee) in partnership with the Center for Popular Music. This National Endowment for the Arts-funded series of "webisodes" on the sources of Southern music will be released on the Internet and through social media later this year. 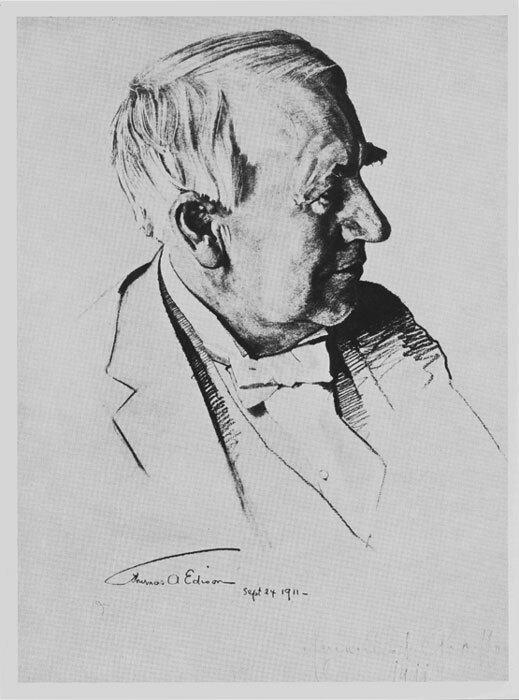 "Edison" is a preview of what is to come. The Director of the Center for Popular Music, Dr. Dale Cockrell, can be heard on Let Freedom Sing: Music of the Abolitionists. The program, produced by WGBH in Boston and hosted by NPR's Noah Adams, provides a "chronicle of the idealistic artists, uncompromising personalities, and powerful music of the era, and looks at how these forces combined to turn abolitionism from a scorned fringe movement into a nation-changing force." Cockrell contributed greatly to the program and is interview extensively. In addition to WGBH, the program will air on public radio stations around the country. Listen to Let Freedom Sing: Music of the Abolitionists in the player below. The Director of the Center for Popular Music, Dr. Dale Cockrell, has been offered and accepted the position of Research Associate at the Odeion School of Music, University of the Free State in Bloemfontein, South Africa. The Odeion School of Music is one of the most vital in South Africa, offering a full range of courses from the undergraduate level to the Ph.D. Some 33,000 students attend the University of the Free State, among the oldest and largest universities in South Africa and a leader in the nation's post-apartheid struggle for human dignity and equality. Dr. Cockrell's appointment will take him to Bloemfontein annually for a week of lectures, symposia, and tutorials with students. Beyond that, his primary responsibility will be the conduct of his research and its publication. Dr. Cockrell's appointment followed after a keynote address that he presented at the 2011 conference of the South African Society for Research in Music. The Odeion School of Music, as well as the University of the Free State, is embarking on a program of professional relationships with progressive scholars around the world, and Dr. Cockrell's work seemed to mesh well with the vision of the Odeion School. Dr. Cockrell early in his career taught, lived, and conducted research in South Africa, which significantly enhanced his candidacy and his interest in the position. The Research Associateship is the first in the history of the Odeion School. The Center for Popular Music, in partnership with Linebaugh Library and the City of Murfreesboro, has been selected as one of 50 sites nationwide to participate in America's Music: A Film History of Our Popular Music from Blues to Bluegrass to Broadway. America's Music is a six-week series of public programs, created by the Tribeca Film Institute in partnership with the American Library Association (ALA) Public Programs Office and the National Endowment for the Humanities, and in consultation with the Society for American Music. The public programs will feature documentary film screenings and scholar-led discussions, exploring how twentieth-century American popular music is connected to the history, culture, and geography of the United States. 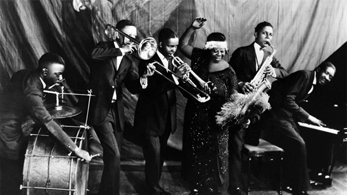 The six films focus on these uniquely American musical traditions: blues and gospel, Broadway, jazz, bluegrass and country, rock, and mambo and hip hop. Dr. Felicia Miyakawa, MTSU Associate Professor of Musicology, will serve as project scholar, introducing and guiding discussion of each film. 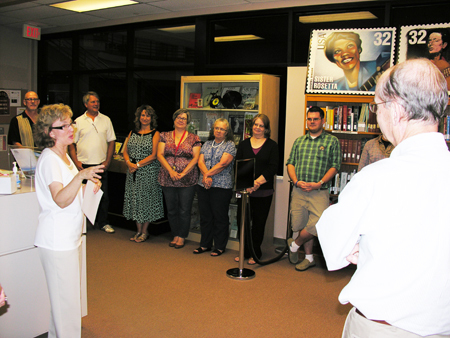 Screenings of the films will be held at Linebaugh Library. Additionally, CPM, Linebaugh, and the City will organize free and open concerts on the City Plaza to complement the films. The grant includes an award of $2500 from NEH to cover training expenses and support local programming to accompany the films. America's Music will be held in Spring of 2013. Check our website for dates and for additional details about accompanying lectures and concerts or call us at 615-898-2449. The Center for Popular Music at Middle Tennessee State University has been awarded a grant by the Tennessee Historical Records Advisory Board to produce "My Homeland" : A Research Guide to Songs about Tennessee. The Center will identify, preserve, and make accessible through a website a unique collection of songs about Tennessee held in its archives. Perhaps more than any other state, Tennessee is associated with music. While many thousands of songs have been written in Tennessee over the last century, hundreds and hundreds have also been written about Tennessee. Because resources have been scattered, there has never been a systematic effort to gather and organize this powerful music. 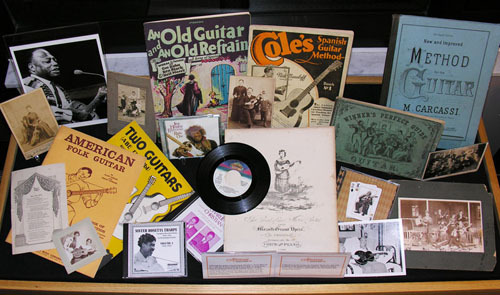 Within the last few years, The Center for Popular Music has acquired two major collections of songs about Tennessee: The John S. Mitchell Collection of Tennessee Music (which contains 1,413 sound recordings, 589 pieces of sheet music, 24 books, 1 film, and 22 posters) and The Peter S. LaPaglia Collection (76 select pieces of sheet music). In addition to these collections, the Center has complementary materials in its general holdings. 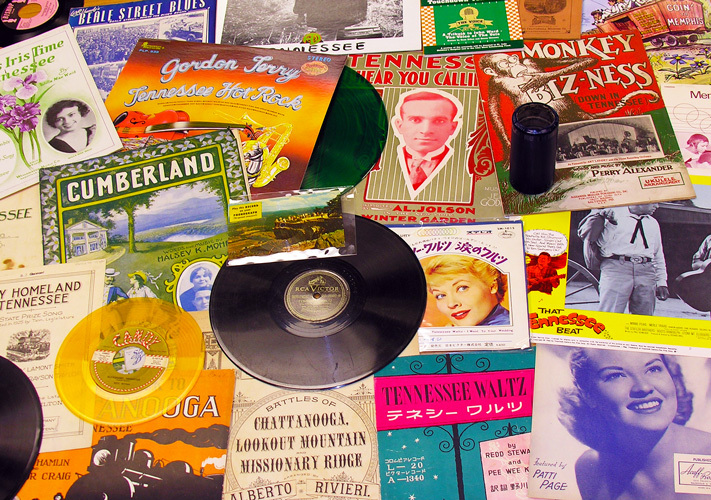 The grant will enable the Center to draw from these unique collections and develop a sophisticated, web-based research guide to music about Tennessee. Approximately 500-550 records will be digitized and incorporated into the website, with a special section on the state songs of Tennessee. Teachers will find materials appropriate for use in classrooms, and students and interested patrons will find compelling songs and images. "MTSU Archivists Catalogue Tennessee Songs"
"Interactive Website Will Immortalize Songs about Tennessee"
Paul Wells Honored by Society for American Music. 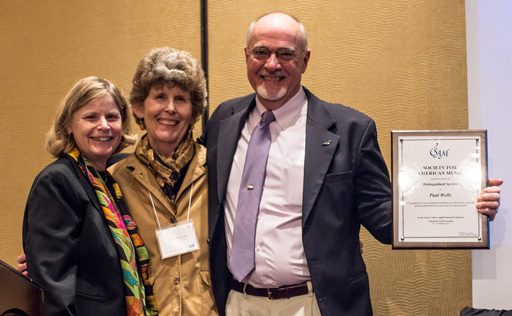 Paul Wells, Director Emeritus of the Center, received the Distinguished Service Citation from the Society for American Music (SAM) during their 2012 Annual Meeting in Charlotte, NC. "This honor is given by the Board of Trustees to a current member of the Society who has given exemplary and continued service to the Society and its mission." 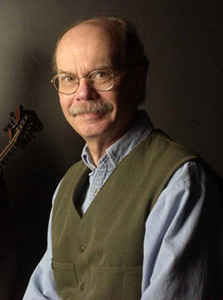 The full citation reads: Paul F. Wells has been a member of the Society for American Music since 1987 and has served the organization in many capacities: He has chaired or served on nearly every committee of the organization, including publications, nominating, program, honors, editorial board (twice), conference management, as well as the interest group on folk and traditional music from 2009-2011. He was on the board from 1990-1992, served as President-elect, President, and past President from 2000-2004, and hosted a most memorable Nashville meeting in 1989, when the late, great Bill Monroe was awarded honorary membership. Not only did Paul get him to the meeting (something which does not always happen with our honorary members), but also had him play for the banquet. Dancing to the music of the legendary bluegrass master is something those of us who experienced it will never forget! Paul has always been a voice for remembering that side of American music that celebrates music of the vernacular, as well as of those people who make it happen. 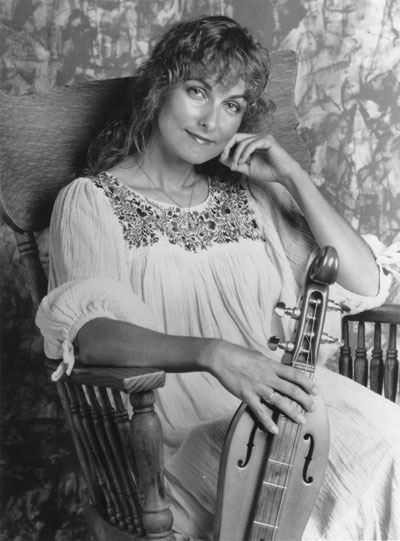 While on the Honors Committee and afterward, Paul was instrumental in getting honorary memberships for the Georgia Sea Island Singers in 2000, for country singer Loretta Lynn in 2002, for the folk singer and scholar, Mike Seeger in 2003, and for the legendary record producers of Arhoolie and Indian House, Chris Strachwitz in 2004, and Tony Isaacs in 2009. His many papers and publications on various fiddle traditions in the U.S. have been memorable, and most recently, he and his wife, Sally Sommers Smith, were guest editors for the special issue of the Journal of the Society for American Music on Irish American music—a first of its kind. 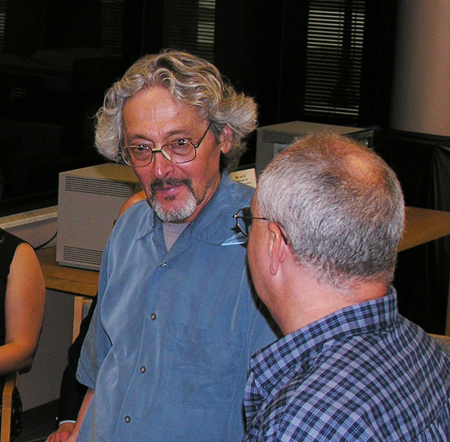 Beyond his contributions, Paul has been a great friend and research resource for many of us. Always good for a beer and conversation, he has been a fixture at our annual meetings. One of the mainstays of the Society for American Music, we honor Paul Wells for his truly distinguished service and contributions to the spirit and substance of this organization. The Center congratulates Paul on this honor! Keep an eye on your local PBS listings this June. That's when Pa's Fiddle: The Music of America will premiere as a National Pledge Special. Artists appearing on the program include Randy Travis, Rodney Atkins, Ronnie Milsap, Committed, Natalie Grant, Ashton Shepherd, and The Roys -- accompanied by an all-star Nashville band led by Grammy-Winner Randy Scruggs and featuring drummer Chad Cromwell, fiddler Matt Combs, and Hoot Hester on mandolin. Historic background on the music is provided by the Center's own Dale Cockrell. In the meantime, watch this extended trailer for the program. Dr. Mike Alleyne, a member of the Center for Popular Music's Advisory Council and Professor in the Department of Recording Industry at MTSU, delivered the 15th Annual Bob Marley Lecture at the University of the West Indies in Mona, Jamaica on February 16, 2012. The lecture, titled "For the Record: Bob Marley's Island Albums and the 40th Anniversary of Catch a Fire," focused on the albums Marley released through Island Records before his untimely death. "'Catch A Fire' Begins The Marley Legend - 15th Annual Bob Marley Symposium Draws Strong Crowd" (http://jamaica-gleaner.com/gleaner/20120219/ent/ent2.html), an extended article about the lecture, appeared in the Sunday, February 19, 2012 issue of the Jamaican newspaper, The Gleaner. On a related note, Alleyne's newest book, The Encyclopedia of Reggae is currently in publication and is scheduled for release in November 2012 through Sterling Publishing. A concert based on the music written about in the Little House on the Prairie series of books by author Laura Ingalls Wilder, was filmed on Friday, January 6th, 2012, at the Loveless Barn in Bellevue, TN before a live audience, for broadcast by the PBS television network. Pa's Fiddle: America's Music will broadcast first during the June pledge-drive season on PBS stations throughout the nation, and be available to those stations for broadcast over the next two years. Artists performing included award-winning musician and musical director Randy Scruggs and an all-star string band, Randy Travis, Rodney Atkins, Ronnie Milsap, Ashton Shepherd, The Roys, Natalie Grant, and Committed (NBC Sing Off Champions). Dean Butler, who played "Almanzo" on the Little House on the Prairie TV show, and the Center's own Dale Cockrell, who also happens to be President of Pa's Fiddle Recordings, teamed up to produce this unique show that featured these top-level artists performing and giving their best interpretations of the great American songs and tunes loved by Pa and Laura Ingalls during their lifetime. A documentary about the making of the show is also being produced by MTSU and will be widely available for educational purposes. To commemorate the occasion, a brand new album will be released by Pa's Fiddle Recordings, titled Pa's Fiddle: American Fiddler. The CD will be in stores first on June 5th. It is, however, available as a pre-release special now at www.laura-ingalls-wilder.com. 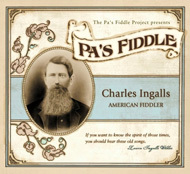 This newest album spotlights the musical influence of Charles "Pa" Ingalls. Ingalls, sometimes thought of as a fictional character, was quite the opposite. He is perhaps the least recognized old-time fiddler from the 19th-century who, courtesy of the Little House books written by his daughter Laura, we have the most documentation on, in return telling us much about his life and music. His actual fiddle is on permanent display at the Laura Ingalls Wilder Historic Home & Museum in Mansfield, MO. We know the names of many of the tunes and songs he played, where he played them, for whom, and often why he chose them. Hidden for decades in plain view, "Pa" Ingalls (1836-1902) was a central figure in the autobiographical stories told by Laura Ingalls Wilder in her Little House on the Prairie books. He was a highly regarded fiddler whose music making is captured by the 127 songs referenced in his daughter's books. It is surprising that this extraordinary musician is never included among the pantheon of American fiddlers, especially since he, his name, his stories, and accounts of his music-making are known to many millions the world over. Dale Cockrell has assembled and edited a scholarly collection of all 127 songs, entitled The Ingalls Wilder Family Songbook (A-R Editions, 2011). The album, which features songs chronicled in the books, helps place Charles Ingalls among the first rank of old-time fiddlers whose influence is foundational to so much of modern American music. It tells of the power of music to transcend the years, as the "old" songs of Pa Ingalls becomes new again through exciting and dynamic performances by some of the today's finest acoustic musicians. Great American songs on the CD include "Buffalo Gals," "When Johnny Comes Marching Home," "Polly Put the Kettle On," "Life Let Us Cherish," "All the Blue Bonnets," "Golden Years Are Passing By," "Boatmen's Dance," "Mary of the Wild Moor," "The Campbells Are Coming," "Haste to the Wedding," and more. 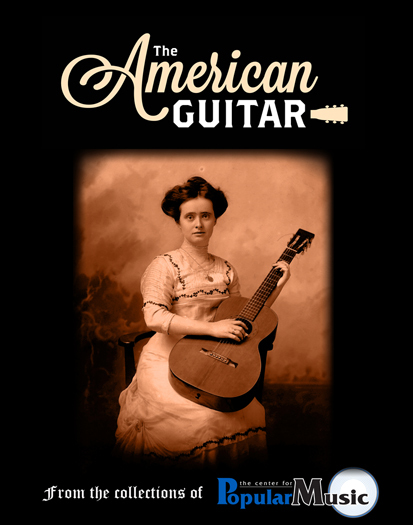 Acoustic masters Bryan Sutton, Matt Flinner, Matt Combs, David Grier, Jeff Taylor, Dennis Crouch, and others bring these great American folk songs to life on the album, and make them palatable for young ears of today. 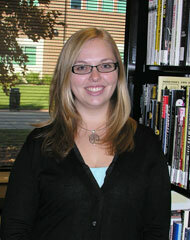 The Center is back to being fully staffed with the addition of Lindsay Million as our Cataloging Assistant. A recent transplant to middle Tennessee from Michigan, Lindsay comes to us from Murfreesboro's Linebaugh Public Library, where she worked in both the Reference and Cataloging departments. She holds a Master of Science in Library Science from Clarion University, in Pennsylvania, and a Bachelor of Science in Anthropology from Grand Valley State University, in Michigan. We're very happy to have Lindsay as part of our team! For additional information about Lindsay, visit our Staff page. died on October 16, 2011, in Hanover, NH. 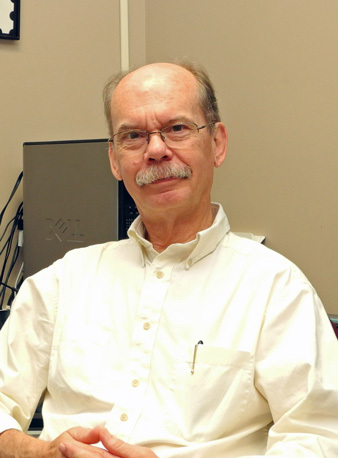 Dr. Hamm was Professor of music emeritus at Dartmouth College, and had also held positions at the Cincinnati Conservatory of Music, Tulane University, and the University of Illinois-Urbana, as well as numerous special appointments. He was the author of many books on American and Renaissance music and innumerable articles and reviews. His seminal Yesterdays: Popular Song in America (W. W. Norton, 1979) remains the fullest treatment of the whole history of American popular music. He was a former president of the American Musicological Society and was honored by that organization with Honorary Membership. The Society for American Music honored him with its Lifetime Achievement Award. He was a founding member of the International Association for the Study of Popular Music. Charles wrote the key consultant's report in 1985 that led to the establishment of the Center for Popular Music in 1986. In several ways, the Center owes its existence to him. In all, a giant has passed from the field, one the likes of which we shall not see again. After a nationwide search, Dr. Dale Cockrell has been appointed as the new Director of the Center for Popular Music, effective September 1, 2011. Dr. Cockrell has a distinguished academic, scholarly and professional record in Popular Music. 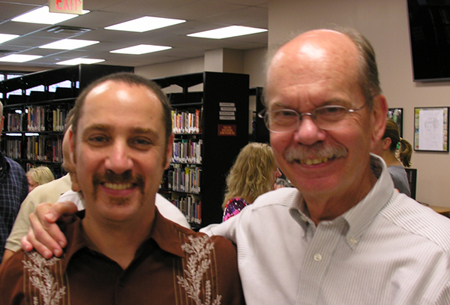 He comes to MTSU from Vanderbilt University, where he was Professor of Musicology in the Blair School of Music. He is the author of Demons of Disorder: Early Blackface Minstrels and Their World, Excelsior: Journals of the Hutchinson Family Singers, 1842-1846, and more than 100 other books, articles, papers and monographs devoted to the study of American popular music. His books have won various awards, and he has been elected to numerous leadership positions, including the presidency of the Society for American Music. 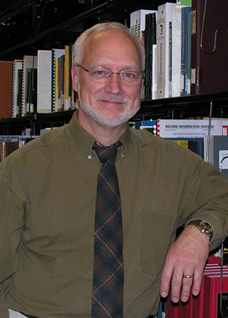 Dr. Cockrell has won several grants, including three NEH Fellowships. He has held positions at the University of KwaZulu-Natal (South Africa), Indiana University, Dartmouth College, Middlebury College, the College of William and Mary and the University of Alabama. He edited The Ingalls Wilder Family Songbook (a critical edition of the music referenced in the Little House books), which was recently published. He is also founder and president of The Pa's Fiddle Project, an educational, scholarly and musical program dedicated to recording the music of the Little House books and to reconnecting the nation¹s children with the rich music legacies embedded in them. We have been busy working to improve the CPM website. It has been a long time coming (since 1997! ), but it's finally here! 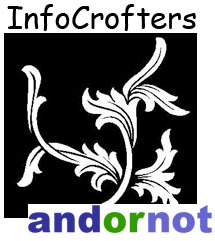 We are still working on things, so please visit often to see what is new. For the past 25 years researchers have searched the CPM's special collection materials through independent databases using the InMagic® database system. There was no way to search across all of our collections at the same time. But now we have combined nine unique databases into one catalog of almost 90,000 records. You can now search in one user friendly interface for manuscripts, periodicals, photographs, posters, playbills, programs, rare books and scores, sheet music, song broadsides and trade catalogues. This spring and summer CPM staff worked with InMagic® Partners Ann Stringfield from InfoCrofters in North Carolina and Andornot from Canada to merge the databases and create a better search experience for our users. The new search interface features a quick and advanced search screen, several brief record result formats, a full display format, plus excellent database navigation. You can also choose from Email, Save and Print options, including Bookmark and Share attributes. Some of the items include images and we will be adding more in the coming months. We hope you find the new search a better tool for locating popular music items. Please let us know how you like the new search and how we might make it better. 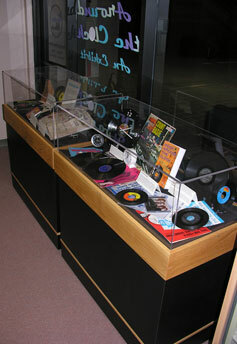 The CPM now has two new custom-made display cases in which to showcase our splendid collection items. They were designed and built by Miriam Owen and Stephen Forrester of The Owen Design Group to fit under the large windows across from the reference desk. The cases are secure, state of the art, and include casters so that they can be moved to accommodate new needs. So far, we have mounted two exhibits in them. The first was "Global Pop: Denmark," an exhibit focused on contemporary music in Denmark, to complement a CPM lecture in April. The second was "Rock Around the Clock," an exhibit exploring how clocks have been referenced in popular music through the years.